Jesse must have slipped a gear. The Rev. 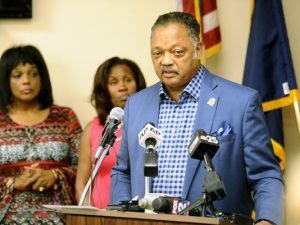 Jesse Jackson announced Monday that he is urging fans to boycott the National Football League until team owners offer Colin Kaepernick a chance to return to the league. Jackson said at a Detroit news conference that the former San Francisco 49ers quarterback’s right to speech and gainful employment was violated when NFL teams refused to sign him this season because he knelt in protest during games last season during the National Anthem. Kaepernick said he would not show pride for a country that oppressed black people. Jackson suggested that Kaepernick take legal action for having his rights infringed. Jackson, who was joined by Wayne County Clerk Cathy M. Garrett and Detroit Clerk Janice Winfrey at the news conference, also said he would be investigating reports of voter fraud and voter suppression in several counties in Michigan. Jackson questioned the high turnout in Macomb County, a key region where Trump won, 54-42 percent, over Hillary Clinton. He noted a “flip-flop” in the election where Wayne County voter turnout decreased while Macomb County increased. Results showed Macomb County voter turnout increased by 1.2 percent between 2012-16, while turnout in Wayne County, a historically a Democratic stronghold, dropped by 0.3 percent. Jackson said he planned to hold hearings for people who believed their votes were not counted. Trump won Michigan by 10,704 votes or two-tenths of a percentage point — the first time a Republican won the state in a presidential year since 1988.